Scrub the potatoes well and then put them in a pot with enough water to cover the potatoes by an inch. Generously salt the water and then boil the potatoes until they are tender when you insert a toothpick or fork. Drain the potatoes and let the skins dry out a bit. Place the potatoes on a flat surface and use the bottom of a plate to smash them so they are about two-thirds of their original thickness. Melt the butter in a frying pan and add the smashed potatoes. Fry on one side until golden brown and then flip and fry the other side. 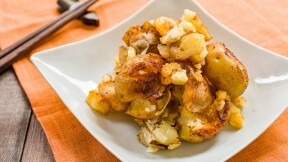 When the second side is golden and crisp, drizzle the soy sauce evenly over the potatoes and flip them once to coat evenly. They are done when all the liquid has evaporated and the potatoes are coated with a crisp crust of caramelized soy sauce.